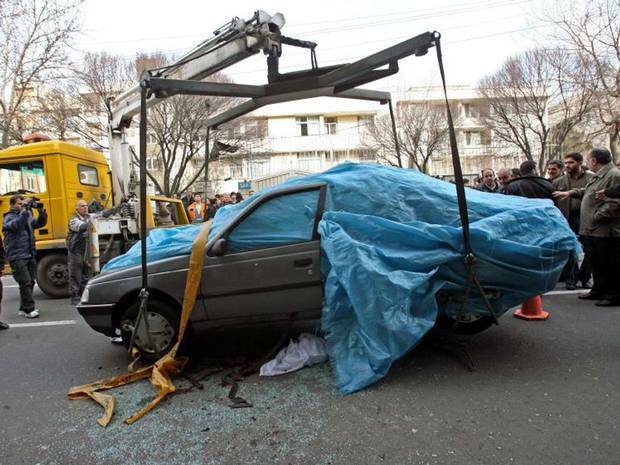 Four years ago on a late November morning in Tehran, Majid Shahriari, a physics professor from Shahid Beheshti University was on his way to work, when in the middle of heavy traffic, he noticed a motorcycle moving closer to his car. A moment or two passed, then he heard a loud bang on the side of his car. Before Shahriari’s had a chance to see what happened, his vehicle exploded. He was killed instantly, while his wife, who was travelling with him, was badly injured. His vehicle had been blown up with a magnetic limpet bomb. On the same day, in an almost simultaneous attack, one of his colleagues, Fereydoon Abbasi, a laser expert at the country’s Ministry of Defence, noticed a motorcycle following his car. Quick thinking on his part saved him and his wife, as he managed to leap from his car before the device went off. In early 2012, Mostafa Ahmadi-Roshan, an expert in uranium enrichment, and a director at the Natanz enrichment plant was travelling in his car, when just like Shahriari, he heard a sharp slap against the side of the car. Moments later the magnetic bomb detonated and he along with his driver were killed instantly. Eight months later, 35-year-old Darioush Rezaie, was killed outside his daughter’s kindergarten, when someone approached him and his wife, and began shooting. He was killed, while his wife suffered severe injuries. Just like on previous occasions, the perpetrator managed to escape on the back of a motorcycle. In light of the five assassinations of Iranian nuclear scientists that have taken place since 2007, what feelings run among the men and women who make up this elite community is anyone’s guess. Even though their chosen field is beset with risks, many know that they have little choice but to stay in the country and continue their work. From the perspective of the intelligence community, targeting Iran’s most experienced and educated scientists makes logical sense, as it strikes at the heart of the country’s nuclear activities. According to an article which appeared in the Slate, there are estimated to be 50 or so individuals who play a critical role in the country’s nuclear activities.To gather the knowledge requires years of study and it is not easy to replace such skilled individuals. The Iranian authorities, after each assassination, have been quick to pin responsibility on Israel, or rather the “Zionist regime”. Although the United States is usually cited as equally culpable. Nevertheless, there is widespread acknowledgment that Mossad is the instigator of the attacks. It is thought Israel’s foreign intelligence agency recruits Iranians who follow the comings and goings of their intended targets for weeks, before selecting the most optimum moment to strike. One captured agent, Majid Jamali Fashi, who was later hanged for his alleged involvement with Mossad, claimed in a televised confession that he had been brought to Tel Aviv for training. He was arrested for orchestrating the assassination of 50-year-old Professor Massoud Ali Mohammadi, who was killed in January 2010. A booby trapped motorbike was placed outside his home in northern Tehran, and was detonated by using a remote control device. Fashi said he was paid $120,000 to carry out the killing and Israeli investigative journalist Ronen Bergman, who has written extensively about Iran’s nuclear programme, says Mossad has a tradition of killing scientists, since it works to spread fear among other scientists that they might suffer the same fate. Mossad’s recruits most likely come from the within controversial opposition group known as the Mujahideen-e-Khalq (MEK) whose supporters are familiar with the country and can easily blend in. Mossad has an ironclad reputation across the Middle East for acting in an effective manner, which strikes fear into potential targets. In September, Iran’s foreign minister Javad Zarif warned Israel that it “cannot kill all our scientists”. As a result, according to former IAEA official Olli Heinonen, the Iranians have worked to build redundancy into the system, which allows scientists to shadow the work of physicists, thus offsetting the loss of their expertise. Even so, among the handful of scientists who have died, the motivation behind some of their deaths has not always been clear. In the case of Massoud Ali Mohammadi, who worked at Tehran University as an expert in particle and theoretical physics, his death left many baffled. During Iran’s presidential elections in 2009, Mohammadi was a supporter of the green movement and even some Israelis who participated in a project with Mohammadi expressed surprise over his death. In 2002, as part of the multi-national SESAME project, Mohammadi worked with Israeli scientists and those who met him, described him as friendly and humorous. There are suspicions that his death was not necessarily the work of foreign intelligence, but was ordered by members of the regime to send a message that dissent, especially in such an important field, will not be tolerated. In the cases where individuals have refused to work for the government, their decision has cost them dearly. In January 2011 Omid Kokabee, was arrested at Tehran Airport as he was travelling back to the United States, where he was studying laser physics at the University of Texas at Austin. He was charged with “gathering and conspiring against the national security of the country”. He was sentenced to 10 years imprisonment. However it emerged that Kokabee had been approached by the Iranian nuclear energy organisation to work for them, but he refused. It was one of many attempts by the government to acquire his skills. He turned down a doctorate scholarship from the Atomic Energy Organization of Iran and employment offers at the Research Centre of Malek Ashtar University in Isfahan. Kokabee believes his current predicament is due to his refusal to cooperate. He is now confined to Ward 350 in Evin Prison, which is notorious as the place where political prisoners are sent. He suffers from poor health and his case stands as a stark reminder to anyone in Iran that refusing government offers is not an option. For the individuals that have survived assassinations, their careers have enjoyed considerable success. Later Fereysoon Abbasi would go onto to become head of the Iran’s Atomic Energy Agency and with tensions somewhat cooling as Western and Iranian officials go into diplomatic overdrive to settle, what one expert recently wrote the “decade long impasse”, maybe Iran’s physicists can breath a sigh of relief that their numbers might not be up. However not everyone in the Middle East is pleased with the interim agreement and those at the heart of Iran’s nuclear programme, are fully aware that any attempts to do the contrary of what has been agreed, could mean the likelihood of more magnetic bombs exploding in downtown Tehran.